The Bottom Line: This high-flying thrill ride is the perfect entry point to Lewis’ Jason Conrad USAF series. When budding student pilot Jason Conrad is offered the trip of a lifetime, big aerospace company Century Avionics sets to influence a few key elections, making for some not-so-friendly skies. Maniacal Philip Ashford, bent on avenging the death of his family, is on a continent-spanning killing spree. Though he sees his actions as justifiable, Jason is set on stopping Philip’s self-appointed position as judge, jury and executioner. But as you might expect, Jason finds himself in the crosshairs. The perfect entry point for newcomers to Michael Byars Lewis’ Jason Conrad series, Retribution is book zero, a prequel to Surly Bonds and Veil of Deception. 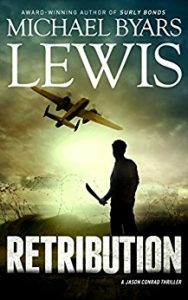 It’s not often that an author can combine business and bombings without overstuffing a plot, but Lewis is up to the task. At times, the Clinton-era politics and personal vendettas seem like a lot to juggle within a relatively fast read, but Lewis reigns in any flights of fantasy, making every word count. The narrative bounces between London, Washington and New Orleans, making for a fun- and action-filled adventure that spans everything from Mardi Gras beads to back-alley dealings. As always, Lewis’ real-world experience as a combat pilot renders every piece of Jason’s story fully realized. Carefully crafted and thoughtful in its build-up, Retribution is a joy for fans of military and political thrillers alike.